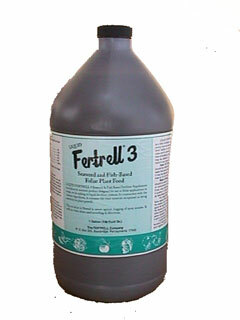 All photos Copyright © Cross Country Nurseries KELP AND FISH #3 FERTILIZER - GALLON - Best especially for tomato plants, and ALL plants, to keep healthy. This product is 90% kelp seaweed and 10% fish, analysis 2-3-1. Seaweed is a "multi-vitamin" for plants, full of essential trace minerals, which helps plants overcome stresses, such as heat/drought, cold/heat, bugs and diseases. Best for tomatoes, and to keep all plants healthy, as it is a preventative for disease. Use as drench, as a soak, or foliar spray. Use 1-2 Tablespoons per gallon of water, once a week for the first 3 weeks after transplanting, then once every month thereafter. We do our first application as a 5 minute soak of the roots/soil/pot just prior to planting, using 2 Tablespoons of each of both Fish, and Kelp#3, followed by a topdressing of Granular Organic fertilizer. Free shipping.